We have a very exciting event right here in Helena at the ampitheatre, which is across the street from our studio THIS Saturday.... Bo Bice will be the headliner. 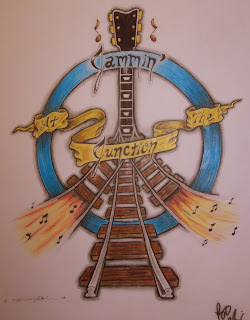 It is a charity benefit, well you can read all about the bands and the details right here at ,JAMMIN AT THE JUNCTION. Dave has been hard at work designing the tshirts for both the poker run and concert. 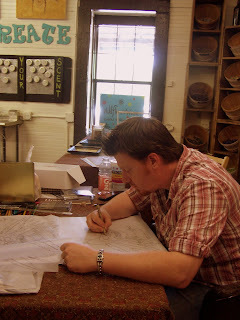 He looks pretty cute when he draws! However interrupting his concentration will bring great wrath, gnarling teeth, the kiss of death, so I just stay away! His Shirt design for the concert. These will be for sale at the event, the original artwork with Bo's signature will also be auctioned off. Hey friends. I'm playing at La Reunion tonight and tomorrow night from 6:30-7:30. He did a phenominal job!